SENEthiopia’s mission is to support children in northern Ethiopia who are classified as having Special Educational Needs, and, in pursuit of that goal, to ensure visually impaired children have access to their full curriculum, including accessible school text books. This has been the genesis of a major project, to provide audio “Talking Textbooks” to those with blindness and the visually impaired. 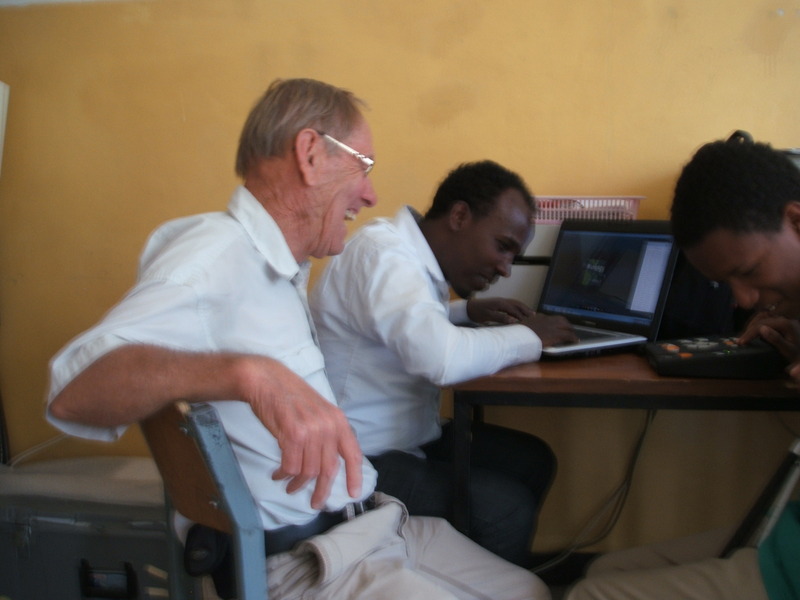 Although some blind secondary students in Tigray know braille, there are very few braille textbooks in schools and most often only in a scattered variety of subjects. Braille textbooks in Ethiopia are expensive to produce, bulky to use in class and cumbersome to carry home each day. It is possible to access textbooks on the computer using the software JAWS, and this is being trialled by SENTigray in conjunction with the Regional Education Bureau. But there are very few computers available. At Ayder High School for example, where JAWS is being piloted, there are only five computers for 26 blind students and, of course, they can only be accessed during school time. 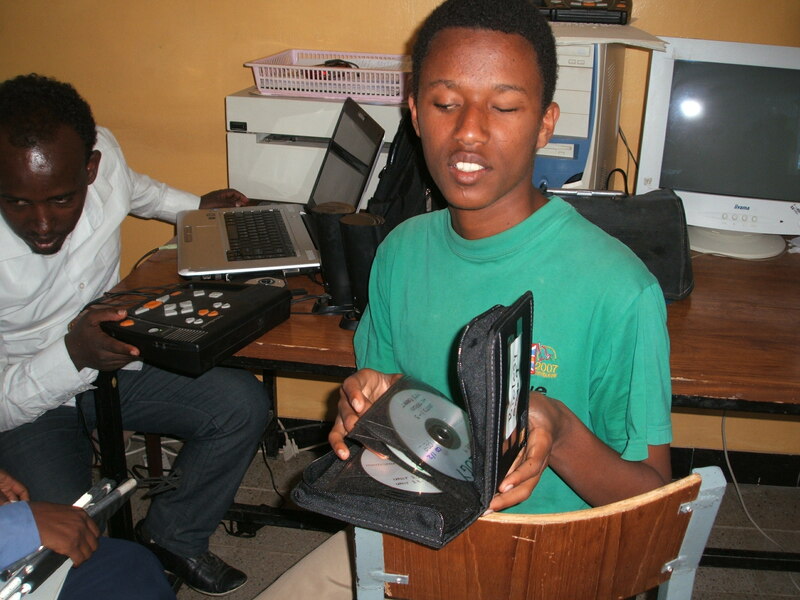 After trying and quickly rejecting audio CD’s as a medium, audio textbooks in MP3 format using headphones or radios with memory cards or flash sticks looked to be a very accessible alternative for providing textbooks in all subjects for each visually impaired student, at very reasonable costs. Our trials of audio grade 9 biology, civics and geography textbooks in November 2014 and February 2015 demonstrated how accessible and appealing to students is the MP3 + headphone and/or radio package. At a push of a button students can track forward and backward to find the section in the text they want. Flash memory sticks, headphones and radios are available to purchase locally. And so the talking Textbooks project was born: its aim, initially, to record, duplicate and distribute the new Ethiopian Ministry of Education, English medium, textbooks for grades 9 and 10 biology, civics and geography for approximately 150 visually impaired students in Mekelle. This, we reckoned, would be a manageable pilot project, but a large enough operation to demonstrate the viability of the scheme on a realistic operational scale. Dr Gary Knamiller, himself an Ethiopia VSO veteran, spent the spring and summer of 2015 with a team of editors, readers and audio engineers, recording three textbooks using native English speakers, at the the Talking Newspaper studios in Ilkley, Yorkshire, with their kind permission and assistance. 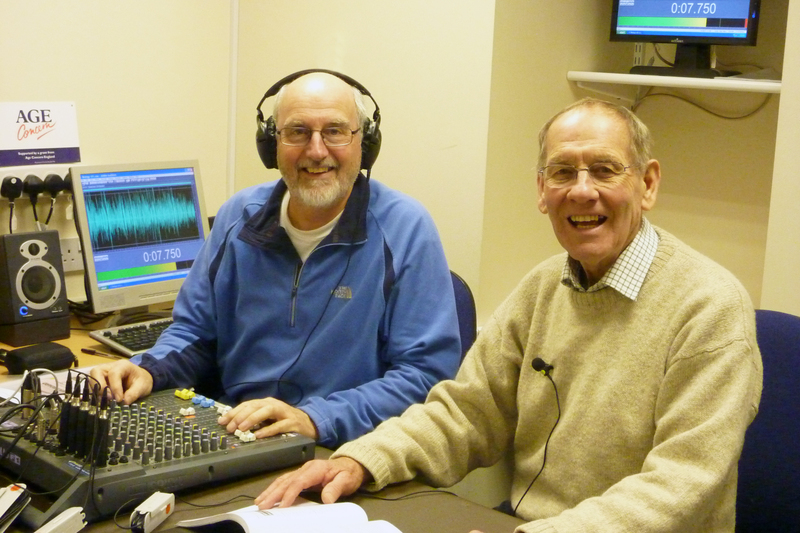 Upwards of 300 man-hours were expended, and Gary located an MP3 playback device which is small, robust, cheap and simple enough to be used and kept by blind students. Gary and Pete, a trustee, took 50 of these to Mekelle in November, some loaded with two recorded textbooks and, with a locally recruited technical manager and the Director of SENTigray, Masho Kidanemariam, passed on as much as they knew about preparing, recording, editing and uploading the textbooks to the players. They developed strategy and timetable for the remainder of the project, which stretches from grade 1 to grade 12, most of which have 6 textbooks. The volume of work, the numbers of VI students (2500 in Tigray province, we believe) and therefore players (one per student), and the scale of administration and monitoring, means that SENTigray cannot undertake the whole project alone, but the Regional Education Bureau has declared its intention to champion the project, and we are in discussions with them. These digital machines won’t completely supersede braille books, and we recognise that it’s important for visually impaired students to be able to read and write braille, especially in a developing country such as Ethiopia, but they will provide access to textbooks for all those students whenever they want it, which at present they do not have.